We are a new backpacker hostel in the heart of Kampala's upmarket Kololo area, within walking distance of the best bits of the city. Hot showers, cold beers, fat cats etc as standard. The Fat Cat sits on the edge of Kisementi Square, home of some of the city's best diversions including a massive cinema, bars, restaurants and shops. We've even got 2 (yes, two) icecream parlors just down the road. Madness. 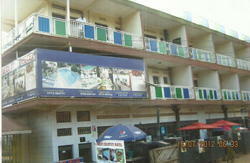 It's the most centrally located backpackers in Kampala and offers great beds at great prices. Our facilities are basic but clean and well maintained, and our staff (available 24/7) will do everything within reason to make sure that your stay in Kampala is lovely. We offer shared rooms only. If you would like a private room we will be happy to point you in the direction of some of our friends in the city. Check in up to 04:00. We have a cat and a dog and while neither enters the dorms, both are around. They're both friendly and pretty dumb but just to let you know. Smokers are welcome but please don't smoke in the rooms. Please note: The pronunciation of Kamwokya is Kam-Oh-Cha. This will save you a lot of hassle. If youâ€™re travelling by matatu, from the New Taxi Park take a matatu to Kamwokya (direction Ntinda) and get out at City Oil Kamwokya (the matatu conductor will show you). The journey costs 1,000 UGX (40Â¢). We are about 3 mins walk from City Oil, near Iguanas. If youâ€™re lost head to Iguanas and ask the motorcycle guys outside. If youâ€™re travelling by boda boda motorcycle, tell the driver to take you to Kisementi or Iguanas. We are 2mins walk from the square. From the city centre if youâ€™ve got a big bag the bodas will charge you around 5,000 UGX ($2). If youâ€™re struggling to explain where you want to go, try saying City Oil Kamwokya. If youâ€™re travelling by taxi/special hire, give the same instructions as for a boda. Expect to pay somewhere around 20,000 UGX ($8) from town, and about 100,000 UGX ($40) from Entebbe Airport.